It is quite natural for us to look and feel better even if it means having good stuffs for ourselves or for our loved ones and for our home. My family is into business for several years already. The furniture has been existing more than 15 years ago and it has thrived through my mom's painful endurance. We do have our own boutique too and we took the advantage of exhibits to show off our stuffs. The exhibitor even asked my mom if she would like to have the furnitures exhibited as well. But, since the business has been known for long, we don't see the timing of the exhibit when she is all busy. But, I wish we can have our own exhibit resources like trade show flooring, and trade show carpet to make our items more presentable. Further, it will be nice if our own logo can be used on logo mats and logo canopy. Perhaps, if resources will allow it, we can have our furnitures in exhibits to widen our business market. It does not hurt us to show off only when we have beautiful stuffs to be proud of. It is officially February 13 in the Philippines and we are simply too excited of two things, Valentines Day and Chinese New Year. These festivities actually fall on the same day, February 14. We are not full - pledged Chinese but somehow, we join the celebration hype even through simple meals and all. Forsure, we will be having tikoy and I shall ask my mom to cook some Paella. These meals normally mean close family ties. While the rest of country is having the enthusiasm of this love day, in other conservative countries like UAE, celebration of Valentine's Day is forbidden. Media and commercial establishments are into different gimmicks just to have this special day worthwhile and romantic for everyone. Most likely, I shall just have a dinner with family. Happy Love Day everyone! I have a number of blogs made in Blogger and I found this platform more easy and convenient to use. But, as a blogger who does paid works, I was compelled to try Wordpress. And, like any other sane person who hates transition, the Wordpress setting is quite a struggle. I could not even search the section where I can add widgets. I am really an idiot. LOL! Apart from adding widgets, I need three - column format and I can search these from Free Wordpress themes. At least, adopting them can be easier. I had my varying themes but I still search for other designs I can boost. I wish to have my very own customized theme. Perhaps, in due time, I can find Wordpress setting exceptional. I just have to read tutorials and to try other tips to make my experience with Wordpress more worthwhile and easy. Bariles had asked us to join him on the City Address of General Santos Mayor Pedro Acharon, Jr. The rest of the Gensan bloggers who are free were asked to witness the SOCA. And, although I committed to be around during his speech, I have to still see my students this afternoon for our lecture. I can however, miss my laboratory and head to the venue although I won't really be missed. Geez, I might as well miss the talk and just attend to my class. LOL! Well, the SOCA will surely highlight the accomplishments of our Mayor and future projects the city will be having. Under our city mayor administration, our city has become more known and progressive. This is one pride one General can have. I must however, finish all my works should I decide to join this event. I Am Vain But . . .
Every sane person will say that he wants to look and feel good. But, somehow inferiority consumes self-esteem that he wishes to look differently and feel appreciated. I am indeed vain with my appearance. It started with my pouting lips, gap teeth, and not too pronounced nose. I did not smile well because of my facial features that as soon I had the resources, I got my teeth fixed. But, if I have more resources, most likely if not, I shall have my nose done, and body sculptured from unwanted fats. But, vanity is popular not only among women but also among men that plastic surgery has become the prime solution. This is quite popular among celebrities whose personality is a big concern. These celebrities and other commoners opted for plastic surgery to look good in spite of pricey costs. But, risks are always there that any normal surgical procedure can turn out bad. Some sources cited a few celebrities whose surgery turned wary and gross that the patients themselves would rather have their old selves back. To name a few, the list includes before-after images of Jackie Stalone whose latest picture is associated with a picture of a bulldog, Donatella Versace, Pete Burns, Kenny Rogers, Dennis Avner who explicitly wanted to appear a cat, Amanda Lepore, Michael Jackson and Michaela Romanini. But, to top these gone - wrong surgeries are the works of Hang Mioku, a Korean - based lady whose after face definitely of another planet. She was quite pretty in her old self but with too much plastic surgery obsession, she had done several procedures mainly on her face. With series of procedures, her face was left disfigured that no other surgeon would take her case until she met a doctor who introduced self - injecting silicones. And, when she ran out of silicones, she injected herself with cooking oil. Thus, a more aggravated condition inflicted this lady. 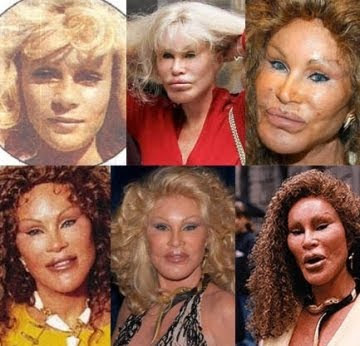 Also, another popular case is Jocelyn Wildenstein who deliberately did several procedures to look like a cat in behalf of his late husband Alec Wildenstein, an important businessman with a love of exotic animals. She was divorced over his extra-marital affairs and to win back her husband, she had her face done to resemble a cat. These worst cases of plastic surgery are adversely caused by Body Dysmorphic Disorder (BDD), a psychiatric disorder characterized by strong belief that there are physical defects that need to be corrected when in fact, they appear normal. Plastic surgery may do wonders but for someone who has BDD, the effects are disastrous. Thus, before anyone goes to plastic surgery, it is quite important patients are well asked about their mental stability. So, this responsibility lies mostly on responsible surgeons who are not just after earnings but also the safety and welfare of their patients. One can check Los Angeles plastic surgeon who is socially responsible and competent with his craft. We all want to be beautiful, in natural way or otherwise. But, what is unacceptable is the possibility that our chosen medium can do more wrong than good. We can only be more cautious and confident with ourselves and rely only on competent surgeons. I was awakened up early today to join the potluck party of a fellow blogger-friend, Sheng in a city spring here in General Santos. Although, my kid just had his tonsillitis two weeks ago from swimming at a public pool, he took the plunge from this clean spring and just had great fun. Further, I decided to drive the motorbike again. Although, I was comfortable now in driving, I still felt tensed and quite alert. I guess I really have to get used to it especially if the men at home are not around or something. It was indeed a great fun with family and friends. With the stress from work, business and personal life, I terribly need a life. I quite miss my old friends that I wish I can just disappear and be with them and just have good fun. During my free time, I only consume it through movies, shopping, and blogging. Sometimes, gimmicks with fellow bloggers help. But, one can only be with his limits until he decides to venture out. I can go on vacation again, be with my friends, play around, have fun with discos and Casinos online. My friends and I can choose from high quality casinos who offer generous bonuses, fun games and 24/7 customer support. There are simply to many casinos online. We can only be more cautious and be well informed about scam and fledgling ones. Thus, we might as well go for quality casinos. I hope I have enough resources to see my friends. I have four running blogs and since I have more time to waste, I decided to have another business - oriented blog. However, I must run it in Wordpress. Thus, I am facing a big dilemma, I am lost with Wordpress. I can just write my posts, insert pictures, and just logout. LOL! I am still waiting for a fellow blogger to help me out with customizing the template and getting my domain. For now, I will just content myself with writing my stuffs everyday. It has been weeks when I simply feel so down and distressed that I don't feel well about almost everything. Sigh! I think I am having the aging syndrome. Tsk! Tsk! Tsk! How I wish I have my closest friends around whom I can hang out with and simply have fun. Perhaps, even if I don't find answers to my distress, I can feel relieved. I think I need a break from everything, perhaps a vacation will do. Watching funny movies and hanging around with my kid somehow helps. Gosh! Am I having PMS already. LOL! A Destination to be: Could Ozamiz City really be the next backpackers dream? ¡La Carrera de Internet ha Empezado! — Global Domains International, Inc.